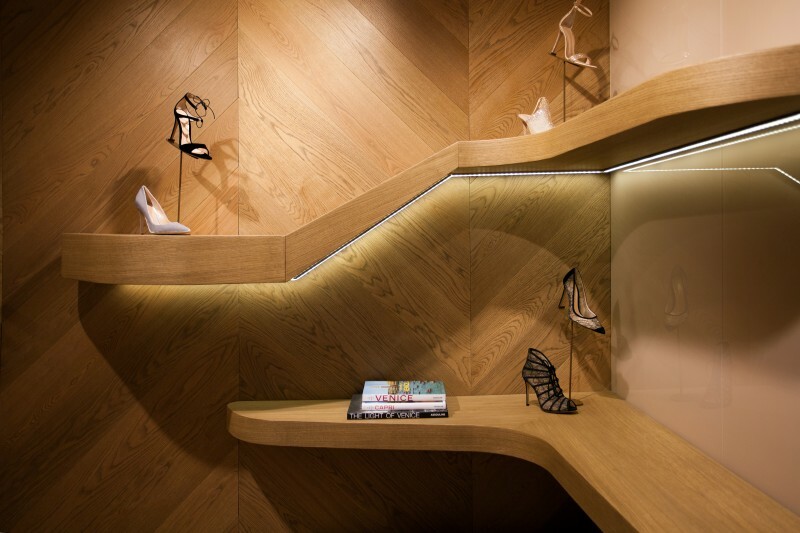 Luxury shoe designer Gianvito Rossi opened his first New York City flagship at 963 Madison Avenue yesterday. The 1,000-square-foot space designed by Milan-based architect Patricia Urquiola features muted shades of pink, oak floors, and snake-life shelving. Having learned the art of shoemaking under his father, famed shoe designer Sergio Rossi, Gianvito launched his first collection in 2007 and has been steadily growing ever since with stores in Milan, London, Paris, and Hong Kong. We caught up with Rossi, who was stateside to celebrate the new boutique, to find out more about the chic new space and what he has in store for the United States. Why was now the right time to open your store in New York City? The collection is very well-received in the States. This part of the journey started in Milan, then the store in Paris, then London, and now this is the first store we are opening in the States. It was challenging, but I’m really happy to be here, because I have come to New York since I was a kid, so for me it’s a very special city. I come here quite often and have a lot of friends here. How hard was it to find your Madison Avenue real estate? It’s always very tricky, but you do it when you are ready with all of the elements of your company in place. You need the structure, because for me it’s very important to do it properly. I like the idea of quality so I wanted to transfer the same idea and the same philosophy I have for the shoes to creating a space that could carry on the same feeling, the same ambience. How long did you look at spaces before you found this one? It took some time to find the space, but it took a very, very long time to do the store, because the building was undergoing a renovation, so we had to wait and it took much longer than I expected. I’ve done work since the beginning with Patricia Urquiola. She’s Spanish, but she lives in Milan. She has designed all my stores. I wanted a very modern place, but if it’s too modern it becomes cold, and I wanted a warmth to the store that goes with the elegance of the shoes. I like the idea of the customer feeling good in the space. You launched your first collection in 2007. What made you decide to branch out on your own? 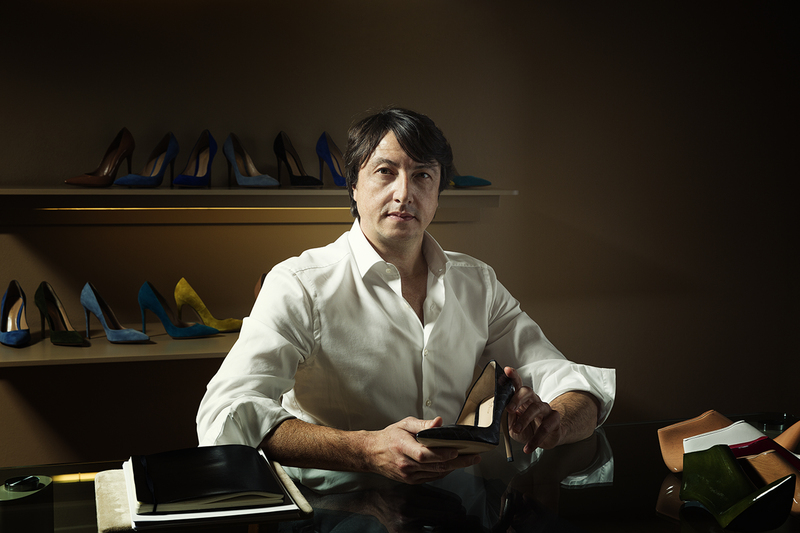 I worked with my father [Sergio Rossi] at his shoe label until he sold it to Gucci Group. After a few years, we stopped working with them. After that, I found myself, for the first time in my life, without shoes. I really grew up among them. That was a strange sensation. I finally understood what they meant to me, because when you have been doing something like this forever it’s not easy to understand what it’s worth to you until you don’t have it anymore. I realized it was my life in a way, my way to speak, so I decided to make my own line. It was more focused. I just wanted to do this modern, elegant, feminine silhouette. It seems people have liked it so far. What has been your best-seller of all time? The Plexi pump is my number one seller. Then I have the Vamp booties that are very popular, and the Portofino pump, which many celebrities have worn. Who was the first celebrity to wear your shoes? Gwyneth Paltrow was one of the first. How important is it to have celebrities be seen in your shoes? At the beginning, it was not a key part, but now it’s getting more and more visible and important. How do you maintain your level of craftsmanship while growing the brand? Maybe people have the perception that this business is bigger than it is, but we still have control over the quality of the brand. A shoe is something that you want to feel is special. It’s very important, the look and the style, but at the same time when you wear it it’s all about the feeling and the perception of the moment, which is directly related to the way something is made. Given your experience in the past, would selling your business to a luxury conglomerate be out of the question? For the moment, yes, absolutely! My children will decide one day. My son, who is 21, is already involved in the business and my daughter, who is 18, will most likely end up in the family business as well. Do you have any other stores planned for the future? The idea is not to have many, many stores, but I think a couple more in the States in the next few years is the plan, but I can’t tell you where yet.